In India, PVC prices have been following a firming trend for the last two months on the back of strong demand while players’ current expectations are mostly centered around further increases for the near term as the Indian market is about to enter its traditional high season for PVC. 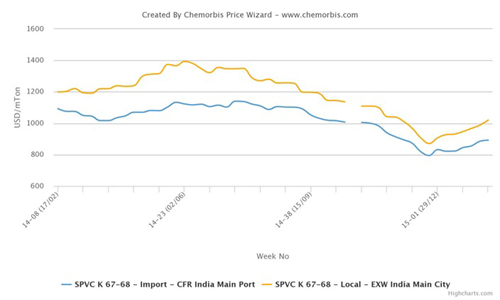 According to data from ChemOrbis Price Index, import PVC prices in India have climbed around $95-100/ton since the last week of December 2014 while local prices have also witnessed an increase of $150/ton during the same period. 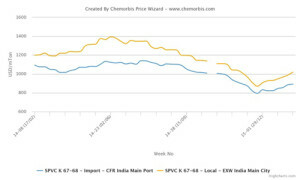 Last week, a Taiwanese major announced their new PVC prices for March to India with an increase of $40/ton. The producer had lifted their February prices by $55/ton. Soon after the producer’s announcement, a pipe manufacturer in India claimed that the supplier had sold out their March quota at their initial offer level. The same producer, meanwhile, revealed their new prices to China and Southeast Asia with an increase of $30/ton from February. According to ChemOrbis, nowadays, players in Asian PVC markets largely concur with the view that increasing PVC prices in India are likely to support other markets in the region, including China and Southeast Asia, in the near future. Sellers are hoping to see higher levels in March with the start of the high season in India while the recent upturn in crude oil and feedstock costs have also strengthened their bullish expectations.